Niobe Thompson, director of Equus – Story of the Horse. Have you ever wondered how the relationship between horses and humans first began? 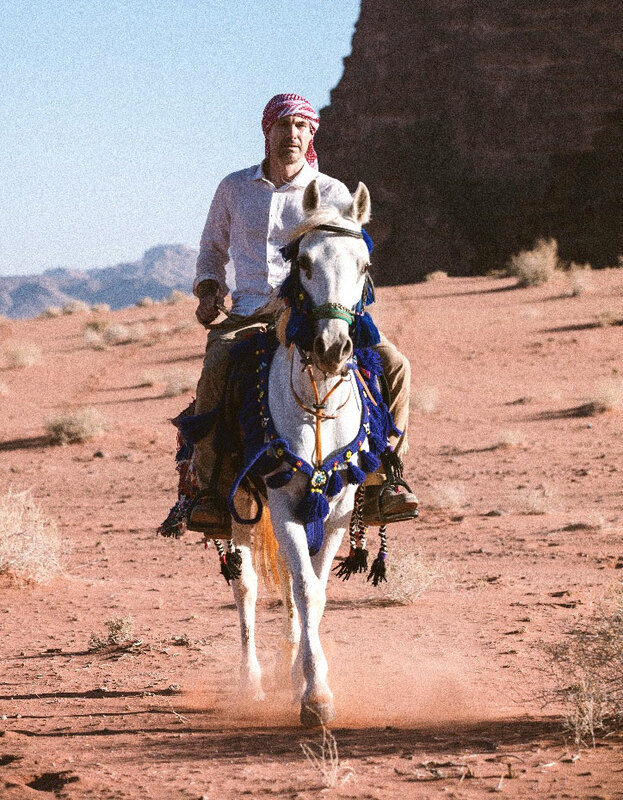 This – and many other questions regarding horses and humans – is what spurred Niobe Thompson to begin his journey of creating the documentary Equus: Story of the Horse. 1. Tell us about Equus: Story of the Horse. Well, this is really a series that tries to look at as many different aspects of our relationship with horses as possible in three hours of documentary. I start with my own point of view, which is as a horse lover and an anthropologist. My opening question is, we can take for granted that horses are a wonderful partner, but what makes them into this wonderful partner that they are? Because if you stand back for a second and you think about what horses are and what they give us, it’s very unlikely. I mean, they’re a huge animal. They’re very fast. They’re very powerful. Yet, they’re so willing to please. There really is no other animal companion like that. 2. How did the idea of the show come about? I’ve always been a horse lover. I had horses growing up. I’ve ridden in a lot of different settings. I’m, by training, an anthropologist. My professional and personal interest is in the human journey, the human story. I’ve always gone back to our story before it was written down. That’s how I came to Equus: Story of the Horse. I was really interested to know how the horse played a role in these incredible changes that we see at about the beginning of the Bronze Age, roughly 6,000 to 4,000 years ago. 3. How did you yourself get into horses? Well, I was just fascinated with horses and wanted to ride them from when I was a kid. I had a Quarter Horse growing up. I’ve got lots of family who live outside cities and have farms, and horses on their farms. I think, like for many people who are into horses, the horse is something I took for granted. This project was an opportunity to step back and ask them questions about this animal, that had never occurred to me before. 4. You don’t own any horses yourself currently? No, no. I’m a full time filmmaker. I’m always traveling. I’m in Mongolia, and Russia, and … this is my life now. So there’s no way. I don’t even have a pet anymore because I’m on the road as much as I am. 5. You are credited as the director for the show. What was it like direction a show that you are also appearing in? Well, it’s a difficult balancing act. But I’ve done it many times before. I’ve always been onscreen and also behind the camera. The reason this works is because I have a crew that I trust and I’ve been working with for years. We’ve developed a way of, sort of, communicating with our words. I can step out of the director’s role, take that hat off, and really join with the people I’m visiting, sink myself into that role, and know that the crew understands what we’re doing. It wouldn’t work with a crew I haven’t been working with for 10 years. At the same time, it is really exhausting and it’s difficult. Some days I feel like it’s a terrible idea. But it seems to work. I started film work as a host. I used to teach in a university. I moved into film that way. I didn’t start as a filmmaker. I started as a scientist who learned how to make films. That’s why I have that role as a host. 6. What was your favourite breed to ride? Without question, the Arab. There’s no questions. We had great horses in Mongolia, really steer footed, hard working horses, just never gave up. I loved the Yakutians. I couldn’t believe how they could put up with the kind of weather we had in Siberia. I was riding a great Quarter Horse, here in Alberta on the ranch, a really good working horse, very responsive, really powerful. But the Arab was so much fun. I mean, the Arab horses that we rode were the real…there’s a stereotype of an Arabian. They were spirited. They just wanted to run all the time, but also they were very sensitive. They were very smart. I’m glad I didn’t have the most spirited horse from that group. One day we rode about 20 kilometres from location to location. One of my friends had this beautiful big mare. She didn’t have a walking gait – she just hopped from two feet to two feet for 20 kilometres. 7. What was the most difficult scene or episode to film? Well, I think that would be a set of sequences you see in Episode Two. We went to a very remote part of Mongolia, the far western corner, the Altai Mountains. It’s isolated. It’s rugged. It’s high up. The purpose for bringing the camera there was to show how horsepower makes things possible that wouldn’t be possible otherwise. They move four times a year. Every year, they spend the coldest months of the winter in the lowest valleys, where it’s not as bitterly cold. All of their animals are pregnant through the winter. They start to drop in the spring, really the late winter. They have to bring the herds to the spring camp, which is higher up in the mountains before that happens, or they lose all the babies. There’s this one point in a year, where they have to thread the needle. They have to go over these high mountain passes with all their livestock. They’ve got sheep, and goats, and yaks, and horses, and camels. Just when the snow is deepest. It was particularly deep the year I joined them. We set off on this five day expedition across the mountain passes. The families, the children, the older people, the women, they took a long route around this mountain range by army truck. But the livestock and the herders go directly. I was with them. It was, the snow was so deep and we were so high, the film crew couldn’t even be there. Every once in a while, the film crew would intercept us as we would cross a lower valley and then leave us behind again. So I had to film most of the thing myself and parse back. It was, I’ve done a lot of riding in my time but I’ve never ridden in those temperatures for five straight days, up and over mountains, sleeping in stone huts. That was the easily the hardest thing I took on for this project. 8. Speaking of, do you have any funny behind the scenes stories to share? Episode Two is really about the earliest horse cultures. It’s about the domestication of the horse and what happened after that. To bring this world alive, we needed to recreate it, dramatic re-creations. We spent a year working in Kazakhstan. I was flying back from our shoots everywhere else to Kazakhstan periodically, casting actors, finding locations, convincing herders to round up thousands of horses for our shoot, even building a replica of a 6,000-year-old village, which is a village of the first people to tame horses. Then we went there with our Canadian film crew, and slept in tents, and filmed for a month. We just traveled by convoy from location to location. It was just an incredible experience. One day we were filming a couple of actors. They were galloping toward the camera. We had this long lens on, this lens that you can take telephoto images with, right? When you’ve got your eye in a long lens, you can’t see what’s right in front of you. The camera man was right beside me. I was right behind me. We’ve got this big camera up in a tripod and this enormous lens. These two horses were supposed to part. One was supposed to go on one side of us and the other was supposed to go on the other side of us. But you know how horses are? They clearly made a decision that they weren’t going to split up. But the riders were still driving them at full speed. Just before it happened, I realized, “Now this horse is gonna go right through us.” I literally hugged the camera man and jumped to the side at the same time as this horse went right through our camera. The eyepiece broke off, as it was attached to his eye and stayed with him. The whole camera went somersaulting down the mountain. He was about three inches away from disaster. The camera got destroyed but we were fine. 9. What do you enjoy the most about working with horses? I find working with horses a real challenge. That’s why they’re rewarding. You have to really engage with them as a personality, as another animal that is in a relationship with you. They have expectations. They have a memory. It’s not just a way of getting from A to B. A horse is a relationship. Anyone who spends time with horses will find all of this, you take it for granted. Anyone outside the horse world really doesn’t understand that. They look at horses like they would look at a motorcycle. It’s a completely different thing. I guess, we’re not trying to humanize the horse with this series. We’re trying to help people understand that horses have agreed to be our partners. It’s a contract. We have a role to play in that contract. 10. Last, but not least, do you have any upcoming projects you’d like to share? This series has consumed my life for the last three years. It’s been a very challenging project to bring to completion. Right now, we’re focused on bringing it to Canadian audiences, then, early in the next year, in a different version to American audiences on PBS, a in French version, and a German version. Just bringing Equus: Story of the Horse, to audiences around the world will be the focus of my attention for the next few months. We also made what I think is a lovely set of short films that are coming to festivals, also about the human-horse relationship. The first one is called Boy Nomad. It’s about a nine-year-old boy in Mongolia, who comes of age and goes on the winter migration for the first time with his dad. That’s a separate project, a free standing short documentary that’s premiering at the Banff Mountain Film Festival at the end of October. The other short film we have coming to theaters is called Fast Horse. It’s about this incredible horse racing tradition in Plains First Nation. It’s called Indian Relay. We followed a team from the Siksika First Nation of Blackfoot horse racers over the course of a year. We followed them as they went to the Calgary Stampede for the first time. The Calgary Stampede has brought this very long standing horse racing tradition into its program for the first time. We were there with our cameras to see it. It’s going to premiere at Imaginative in Toronto in October. Once all of those films have debuted, it’ll take some time to develop a new project. Equus: Story of the Horse premieres on September 23, 2018, at 8:00 p.m. on CBC. It can be viewed here in Canada. In the U.S., PBS’s Nature is airing episodes 1 Origins and 3 Chasing the Wind in January and PBS’s Nova will air episode 2 First Riders in February. The exact dates are TBA.